2 or more: $17.40 ea. 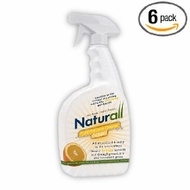 Naturall Multi-purpose cleaners are produced from natural ingredients including orange oils to help eliminate grease, grime and dirt throughout your living spaces. Naturall Multi-purpose cleaners maintain high environmental standards while not compromising effectiveness. The orange oils, corn based ethanol and natural surfactants create a simple and effective cleaning tool for almost any surface.